When I first moved from Canada to Europe in 2013, one of the hardest tasks was to dramatically reduce my personal library. Over the course of many years and two university degrees, I had collected over 400 books and I knew it was unreasonable to move or store them all. Print books take up a lot space and are a pain to ship! I gifted many titles to friends, donated the rest and said farewell to all but a handful of print books. My collection shifted to digital format (thank goodness for iBooks!) and I resolved to stay out of bookstores in case the temptation to rebuild my collection was too strong. Despite having millions of books available electronically, there’s something special about turning physical pages and getting a library card was at the top of my to-do list after moving to Copenhagen in September 2016. Before I had even received my yellow health card (a must for anyone settling in Denmark! 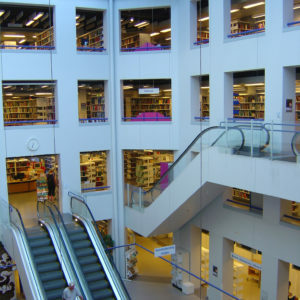 ), I was at the main library on Krystalgade bumbling through the process of setting up a library account. Library card in hand, I wandered the many floors at the main library enjoying the range of materials, marvelling at the intermixed languages in the non-fiction section (Danish, Swedish, German, English, French – all side by side!) and trying to determine how the subjects were organised. As a life-long lover of libraries, I often visit public libraries when travelling and I’m fascinated by the differing classification systems – I still don’t understand the Danish scheme! I’ve since become familiar with Østerbro’s two local libraries, attended author talks at the Black Diamond and discovered that my yellow health card is also my library card – no need for one more thing in my wallet! I’m impressed by how much Danes care about the written word, as demonstrated by the striking architecture of the Black Diamond, the wealth of the library’s collections and the ability for users to access local libraries after-hours. I am also delighted by the ‘Hygge only’ zone at the main library: a sign directs visitors to use the space for reading or chatting – no phones or computers. ‘Hygge’ is one aspect where I notice that Denmark has a surprisingly different culture from Canada or Germany (where I lived in 2013-14). I’ve jumped into Danish culture by studying Danish, watching Olympic curling on DR, experiencing May Day at Fælledparken, making pilgrimages to H.C. Anderson’s hometown and the Dybbøl windmill, overindulging at Julefrokost celebrations and cycling just about everywhere and I’m still uncovering all that Denmark has to offer. In spite of warnings about the Danes’ frosty nature towards strangers, I’ve been welcomed warmly by people at the two yoga studios where I teach. I have Danish and expat friends, can order pastries and engage in small talk in Danish, but it’s really the library system that makes me feel like I belong. Spotting titles I used to own on the shelves of my local library in Østerbro cements the feeling that Copenhagen is home and satisfies my desire to read ‘real’ books – without the need to build a personal library again!